Some members of the Watchdogs at a recent meeting. JoAnn Murphy taught for 43 years in Waverly and Lincoln schools and her husband, Buzz, worked with emotionally ill people in an adult day center before they both retired. In all that time, they never got involved in politics – until Lincoln began debating whether to embark upon a $340 million arena project in a railyard west of downtown Lincoln. They started attending meetings of the No2Arena group – which raised many questions about the arena project’s cost, location and environmental issues. After Lincoln voters approved the project — despite their concerns – the No2Arena group did not dissolve, it evolved — into a new group called the Watchdogs of Lincoln Government. Murphy facilitates meetings and her husband is an active member. We asked JoAnn a few questions about the Watchdogs – whose members are increasingly involved in local politics, from writing letters to the editor to inviting public officials to address topics at their meetings, to attending public meetings wearing their Watchdog T-shirts. How did the Watchdog group get started? Is it an offshoot of the No2Arena group? Watchdogs is an offshoot group mostly of the No2Arena members.. However, there are some folks who have joined who were not part of that group. No2Arena was never opposed to an arena, just the location and funding. The group has some professional people, blue-collar workers, retired folks, Democrats, Republicans, and Independents. We are all concerned citizens who want to influence city decisions for the good of all, not just a few. About how many people come to your meetings? Organizational meetings are usually attended by eight to 12 people. Educational meetings anywhere from 15 to 25 folks. We try to schedule meetings at least once a month – sometimes more. We notify folks through e-mail, and we put notices in the newspaper’s calendar of events. What is the purpose or mission of the group? The purpose of mission of the group is to educate Lincoln’s citizens about what is going on in city government – thus, increasing the transparency of Lincoln’s city government. Transparency is always the focus for our group. That transparency is achieved by informing the public. We hope that once the public is better informed, better decisions can be made about issues. Your members sometimes go to public meetings like the arena board meetings wearing T-shirts that identify yourselves… what’s the thinking behind that? 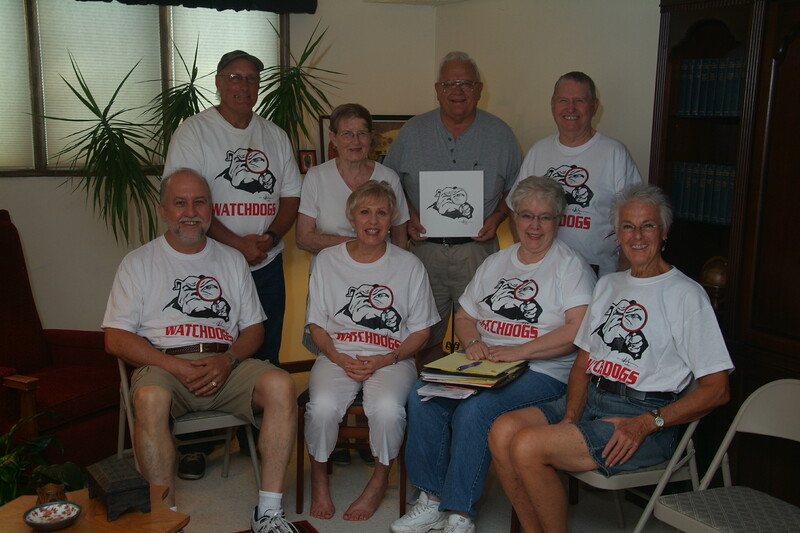 We wear our Watchdogs T-shirts to call attention to our group and its purpose – to be watchdogs (protectors) of our tax dollars. Have you ever gotten any response from the mayor or other public officials to your presence? If so, how did they respond? We have never had any response from the mayor or public officials about our presence at meetings. However, we know that we are noticed by comments during the meetings because of some of the explanations are geared to the public audience – the Watchdogs. Are you actively recruiting people and how large do you hope to become? We are actively recruiting people and would like to grow. We would very much like to have large attendance at our presentations. We have had Dave Landis come to speak about TIF funds, a presentation about lottery funds, a CPA come to explain the city budget. In the future we hope to have presentations about Innovation Park, the Comprehensive Plan, more on the city budget by the CPA, street department, water department, jobs in Lincoln, etc. We have had some discussion about Pershing Auditorium and the Breslow facility as well as other issues. Do you intend to get politically active — endorsing candidates and so on — at some point? We do not intend to get politically active. We want to be a conduit of information and not endorse any particular candidate. What are some issues that galvanized your members — inspired them to join the Watchdogs? Issues that have galvanized our members are expenses connected to the Haymarket Arena project and the continued spending of tax dollars by the city. It appears that it is easy for our city officials to spend other people’s money. Antelope Valley and the proposed LES lines to be buried using the water channel in Antelope Valley are of great concern as well. The increase in property taxes and the wheel tax increase is also a concern. Most who come to our meetings are amazed to find out facts they previously did not know. Are there any obstacles that you’ve come across as you try to grow and have influence? Our greatest obstacles to growth are spreading the word about our group and encouraging folks to become active. We need lots of input to meet the needs of Lincoln citizens for information. Most recently, we have developed fliers that are handed out at events — county fair, Ribfest, etc. We intend to do more of this, perhaps distributing fliers through businesses or displays. If you could tell the mayor one thing, what would it be? Increase the transparency in your administration – not after the fact, but before. Let the voters vote (Antelope Valley, the jail, moving the state fair). Present all of the facts, not half. How can people find out more information about your group? Jane Kinsey is our spokeswoman and can be contacted at jakin6703@gmail.com. The Watchdogs also have a website under construction: http://www.watchdogslnkgov.com. Love the group and JoAnn & Buzz. Keep it up guys, you will make a difference. I have never been to one of their meetings but am 110% behind them and their idea to STOP the waste in city government. For darn sure no one in te city government is doing so. You are right on Jane! I have the email address now, thank you. I know of a couple of people who have mentioned the watchdog group and are very excited! Keep up the good work! You noticed how this group is comprised of the older generation. Of course, they are going to be against the arena. I don’t think you’re going to see many people who are younger than 30 be involved in this group. Afterall, how much you wanna bet they’ll check out the arena once it’s built? It says they were never against an arena, just the location and cost. Saying they weren’t against the arena doesn’t make it so. They were opposed to it’s funding, and the only way they would support the arena was if funding was fully in hand before a shovel of soil was turned. Realistically, make no mistake, they were against the arena. I have nothing against this group. It’s great to see passionate people taking action. I do take issue from time to time with some of the (mis)information spread by the group. But looking at the list of speakers they’ve had, and plan to have, at their meetings, their credibility should only improve. The youngsters will just put their tickets to events as well as dinner in the Haymarket on their already overextended credit cards (just like the City) and continue to damage the economic well-being of the greater community.